Today, the term silverware refers to any flatware, dishware, or decorative objects regardless of the material, as long as it’s made with a gray metallic material. Stainless steel forks are silverware. A silver-plated brass candlestick is silverware. And believe it or not, a silver plate is also silverware. The term silverware has become a generic and all-purpose word, even if the actual material doesn’t fit the original definition. Comparison: When you're sick, do you blow your nose with Kleenex or facial tissues? When you're hurt, do you put a Band-Aid on it or an adhesive bandage? The same way people use proprietary eponyms like Kleenex and Band-Aid, the word silverware is used. So Why Is It Called Silverware? Silverware got its name because silver was often used to make flatware. Long after humans evolved past using primitive tools fashioned from bone and stones, they began making more sophisticated utensils from wood, shells, and eventually metal, including bronze, iron, and steel. When the Romans came along, they also started using silver for utensils. The ancient Phoenicians used silver vessels to keep water pure, and sailors used to throw silver coins into their milk to keep it from spoiling on long journeys before modern refrigeration. This is because silver has oligodynamic properties, which means the metal ions kill living cells and organisms including mold, fungi, viruses, algae, and other microorganisms. While this may sound like silver is kind of scary, what it actually means is that silver utensils are very hygienic and have antibacterial and disinfectant properties. You can imagine how useful this would have been before the advent of modern sanitation and indoor plumbing and why silver became such a popular material for utensils. Despite the amazing properties of silver utensils, most people didn’t use them because they simply couldn’t afford them. Silver was and still is an expensive metal, and only the wealthy could afford wares that were fashioned from it. So while silver was a popular and wise choice for utensils, generally only the opulent used it, which is why silver and silverware became synonymous with wealth. 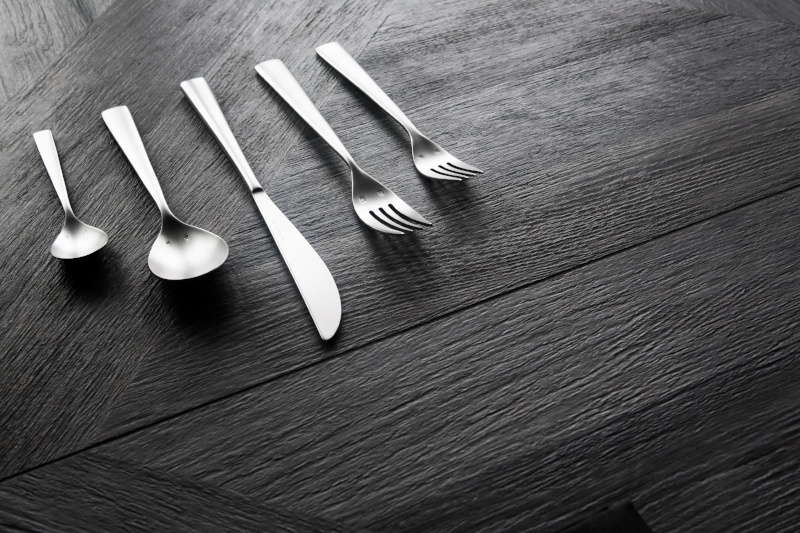 Today, flatware is made from a variety of different materials using a whole range of construction methods and designs. Knowing this, finding the right flatware can be a difficult task. Learn more about silverware by reading the Bauscher Hepp Flatware Selection Tips, and discover what to look for in a fork, knife, or spoon.